When I first stepped into the world of textiles, I was enticed by the art that needed the heavy support of the craft. The more pieces I saw from various regions in Asia my surprise increased instead of decreasing as expected. For, is it not normal to expect that the more we cover, we have less and less remaining. But in this wonderland I feel like Alice – going up the down stairs – the more I distance I cover, the longer the path seems to get and the more distant the goal of ‘I know all there is to know’ seems to be! The latest wonder comes from a piece I have had for several years. 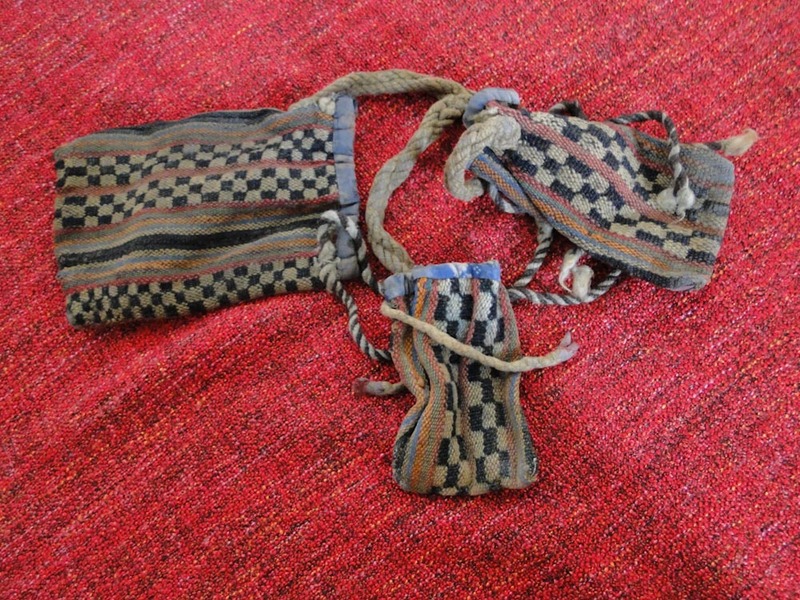 A piece made and used by the nomads of Tibet. A piece from a hundred years ago. A piece that is as dirty as they come. The photos I had were too small and the article had to be reshot. 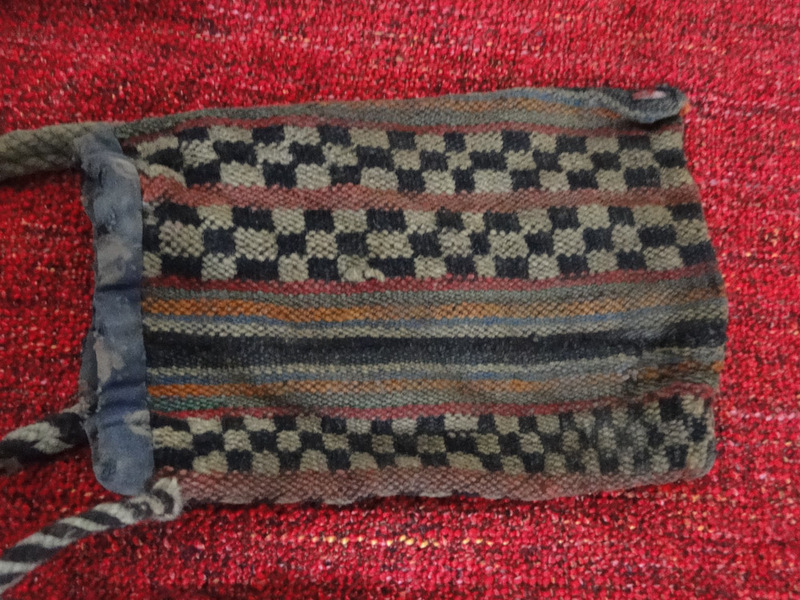 Presenting the fantastic and unusual woven pouch from Tibet. The checkerboard pattern is a popular one in Tibet with several rugs being fashioned with that pattern. But this is the first time I have seen it on a flatweave bag. At the next level, it is unusual because of its trifurcated form. Salt bags used to transport salt on the backs of sheep and goats usually have a double bag structure so that they remain balanced on the back of the animal. Those are also significantly larger than this one. So this triple pouch probably had some other use, quite likely personal since the pouches are smaller than the usual salt bags. The largest is only 23 cm x 16 cm. There is an inner and an outer layer of weaving. The reason for such a format, the complexity of the structure, the difficulty of creating this are all reasons to wonder! If any reader is familiar with this type, please do send in a comment and share your knowledge. This bag is a part of the WOVENSOULS collection and may be viewed here. 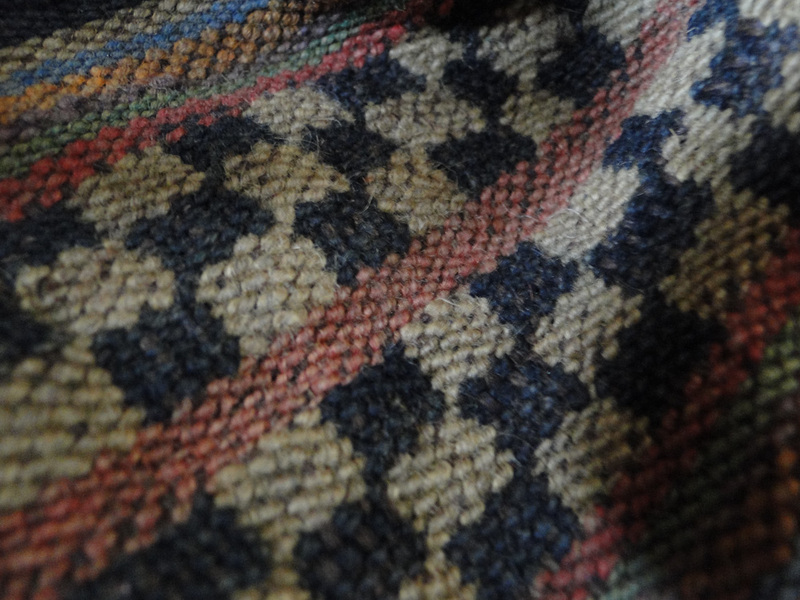 The woven structure of the checkerboard pattern on the little bags is one commonly known as ”warp substitution”. 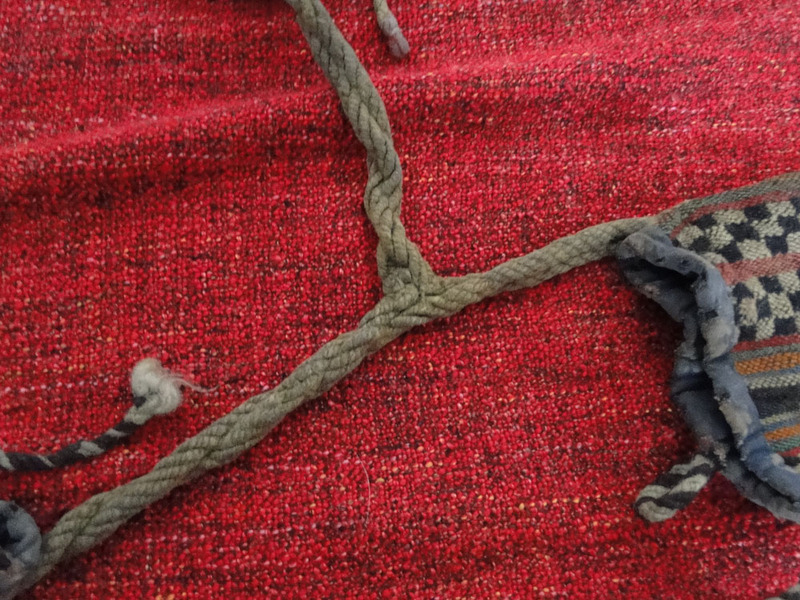 A black thread and a white thread are wound together as one as the weaver prepares the warp. The weaver then selects which color thread he/she wants to have appear on the upper face of the fabric. If white is chosen, the black is dropped to float along the back of the fabric until the design calls it into use. That is why you have those long threads showing on the inside of the bag (the back side of the fabric). 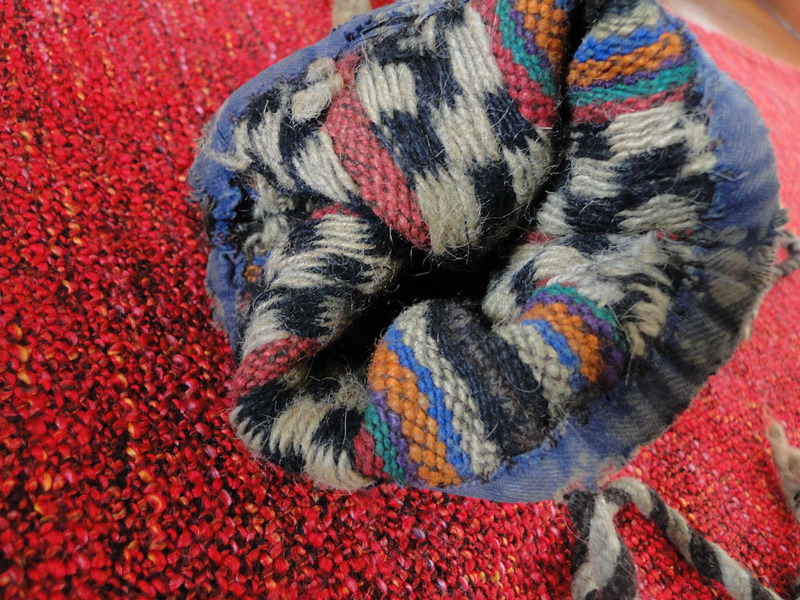 This technique is very common in Bedouin weaving. Wow! This is great learning! Thanks for sharing. 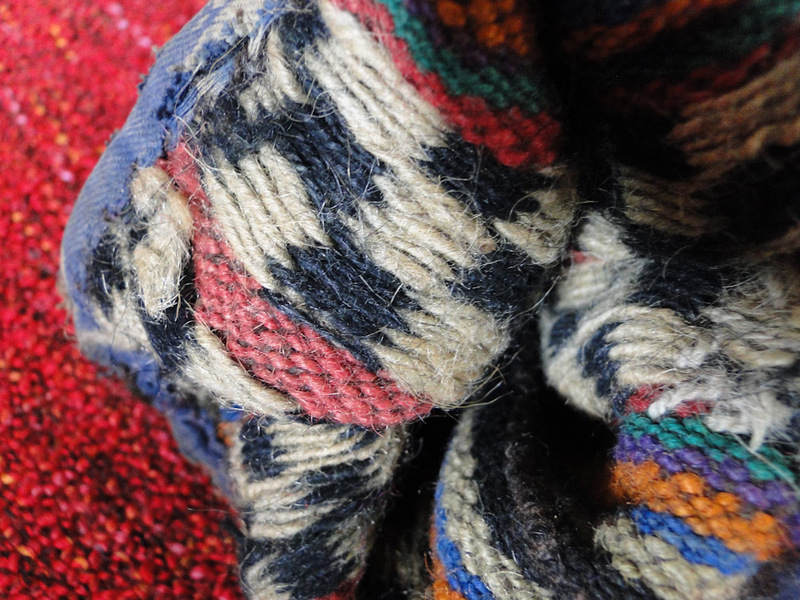 This entry was posted on August 16, 2013 by wovensouls in Art Kaleidoscope and tagged art, Asia, checkerboard, lhasa, Nomad, Nomadic textile, textile, textile art, textile structure, tibet, Tibet textile, Travel and Tourism, weaving, woven.